Humpback whales are like other seasonal visitors that come to Hawaii during the winter time. “It’s cold in Alaska so let’s go to Hawaii!” From late November to mid-April the whales migrate to Hawaii to have fun and give birth. Female whales are pregnant for about 11-12 months, which means they are conceiving in Hawaii and giving birth the next year. Whales planning their annual trip to Hawaii. When the whales are here, some people like to dive down to the ocean bottom, at least 15 feet away from the shore, away from the sound of the surf breaking to hear the eerie, haunting sound of the whales. 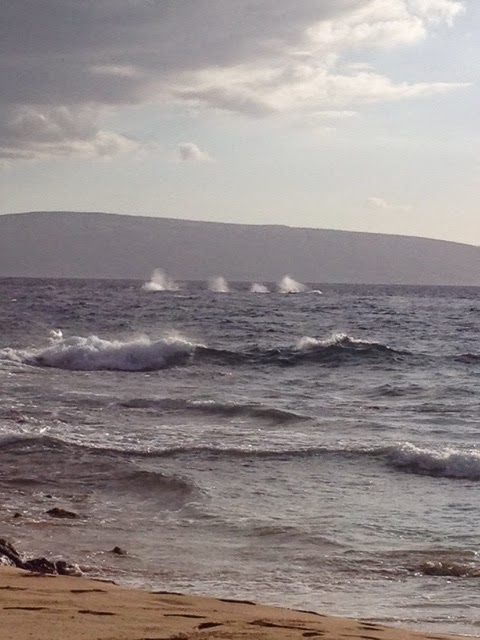 Whales can be seen from all the Hawaiian Islands, but for some reason, seem to prefer Maui. Every February, there is a popular Whale Day Festival with thousands of people in Kihei celebrating the whales. Nowadays, humpback whales are a protected species in Hawaii’s waters, but it wasn’t always so. In the mid 19th century, whales were actively hunted out of Lahaina Harbor. Instead of being hunted, whales are now being counted. The Hawaiian Islands Humpback Whale National Marine Sanctuary holds annual whale counts each season. You can even volunteer if you’re on Maui, Oahu or Kauai. Whales are also constantly being photographed and videoed. But they are difficult to photograph well, because they are a moving target. Whales are hard to photograph! Unless you're skilled and have the right equipment at the right time, your whales are going to be far away. These four whales are pretty close to shore. You can spot a whale by their spouts or "blows" of warm air (looks like a fountain of water or smoke puffs). Whale watching tours are a popular way to get close enough to photograph a whale and usually last about two hours. One can also do a snorkeling or kayaking trip in the morning with a good chance of sighting whales. Another way to watch whales is from the shore. Sometimes the whale show from the beach is better than from the boat, but if you’re lucky, you might get a really close view of whale activity from a boat, like a whale breach. Whales are constantly being studied, and we keep learning new things about them. Astronomer HarrietWitt recently shared an insight about the whale’s bumpy fin. Scientists did not understand why the whales have bumpy fins, because the shape doesn’t seem aerodynamic. After research someone discovered the bumpy fin actually is more aerodynamic in the water than a straight fin. Whale images found on Maui! We're crazy for humpbacks. 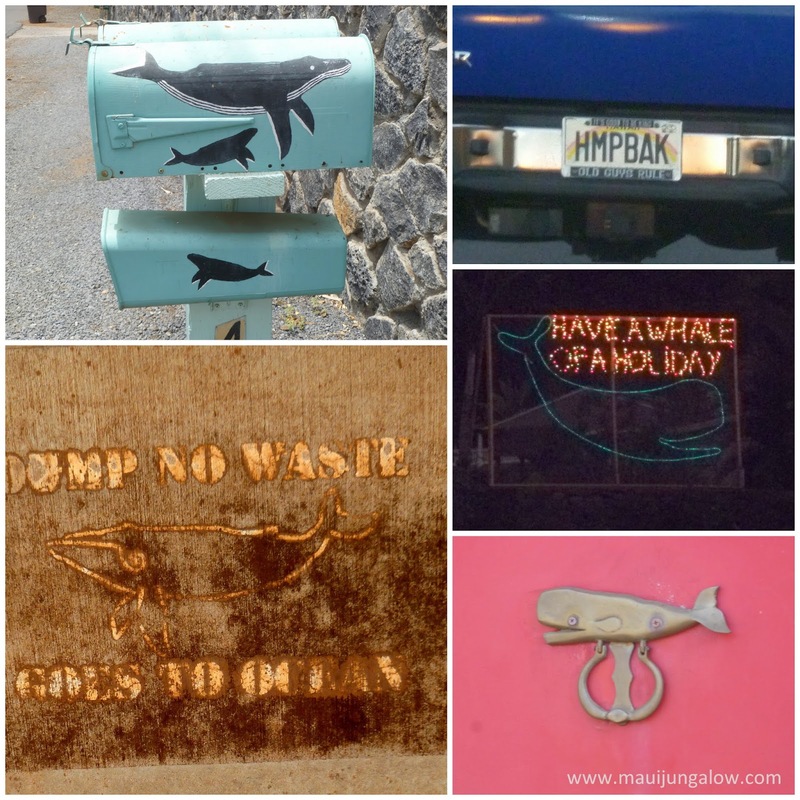 From left to right: whale mailbox, license plate, lighted holiday sign, door knocker, and no dumping sign. Recently, I met someone who shared her story of watching a whale give birth. This event happened in the days before Youtube. She said she was driving along Maui’s north shore, and pulled over to the side of the road to look at the ocean. In the waters below, she saw a bunch of whales around another whale who was rotating in the water. A small tail was coming out of the mother whale. She rotated again and this time there was more of the baby whale sticking out. Each time she rotated, more and more of the baby whale appeared. Meanwhile, the other whales were splashing and jumping and slapping their fins and tails and spouting while she gave birth. Finally the mother whale went down deep and stayed there for a while. When she finally came up, there was a baby whale next to her. The birth took about two hours. The other whales were going crazy and the storyteller said it was as if they were greeting the new whale to their pod. Seeing a whale birth is incredibly rare. I feel blessed just to actually see the whales jump up or slap a fin when I’m looking at the right time and the right place. By the way, I came across a whale tracker (supposedly in real time for Hawaii) via Kihei Car Rentals. P.S. If you are blog hopping from the A to Z challenge, please include your link if you comment! I try to reciprocate comments as quickly as I can, though I did lag behind last year, especially towards the end. P.P.S. I am running two mini-contests during the A-Z Challenge (and into part of May). Here's how to enter. Wow, I had no idea humpbacks traveled that far. Makes sense - conceiving babies in the cold - not fun! Maybe that's why they do it then. Mmm! Never thought about why they would do it in warmer water, but why not? They seem to eat during the summer and fall in Alaskan waters, then all that stored energy goes to making babies or giving birth. Sounds like whales lead very nice lives. 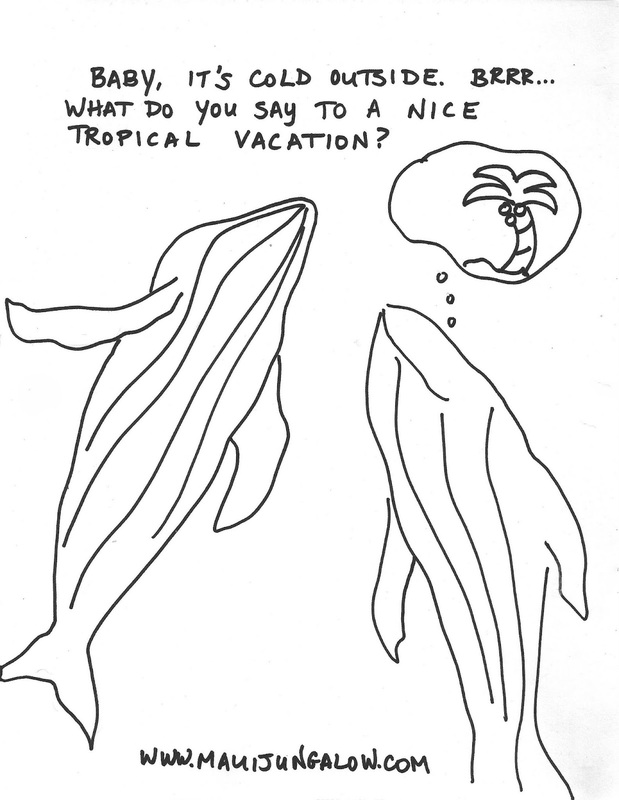 We all should winter somewhere tropical! Yes, they don't do too bad. Except, they still are hunted for supposedly "scientific purposes." Sun - Is There a Dark Side to Sunshine in Hawaii? Kapu - Be Careful What You Do!